A recent poll has found that AKP is facing a considerable lack of support given public perception of its association with Israel. Despite Prime Minister Erdogan's invectives of last week, many Turks -- still very much incensed at the deteriorating human rights tragedy in Gaza -- see AKP as wavering in its position toward Israel, many demanding that Ankara take bold steps to make its disgust known and perhaps exert a modicum of pressure on the Israelis. However, diplomatic action taken against Israel risk good relations that are very much essential to Turkey maintaining its diplomatic clout in the region -- premised on the fact that Turkey has good relations with all countries. Even more problematic is that relations with Washington are likely to be worsened should Turkey decide to strengthen its condemnation of Israel. With Erdogan’s Justice and Development Party (AKP) facing local elections this March, the government’s relations with Israel could be a liability. Placards are appearing at protests showing Erdogan and Olmert shaking hands and accusing the AKP of "collaborating" with Israel. Erdogan may also find himself walking a tightrope when it comes to distancing Turkey from Israel. Ankara has long depended on Israel to act as a conduit to the Washington and to American Jewish organizations, who have frequently acted as a kind of surrogate lobby for Turkey in Washington. In the past, Jewish organizations have been instrumental in helping Turkey block efforts to introduce resolutions in Congress recognizing the Armenian genocide of 1915. "There is real anger with Erdogan on Capital Hill and among people who follow Turkey in Washington," says a Washington-based consultant who closely monitors Turkish affairs. "Nobody is threatening anything right now, or knows if there are going to be repercussions, but this is going to have an effect." Adds the consultant: "There is a sense that Erdogan’s used up a lot of good will." However, to turn the other side of the coin, the United States is using up much of its good will, too. Yesterday, President Olmert boastfully declared that his call to President Bush was responsible for the United States' singular abstention from the Security's Council's otherwise unanimous resolution calling for an immediate ceasefire. The action is likely to anger Turks (and, not just religious conservatives! ), making Erdogan's position all the more untenable domestically. In terms of relations with the United States and Israel, right-wing politicians in America and Israel will no doubt come down hard on Turkey, especially AKP (for an example, see the Likud-sympathetic Jerusalem Post, Jan. 5). These critics are unlikely to be sympathetic to AKP's domestic political concerns, and as Juan Cole observes, might just be able to stick around and cause more harm. UN Secretary-General Ban Ki-moon is scheduled to meet with Erdogan on Friday. In effort to show its solidarity with Gazans, AKP Education Minister Huseyin Celik ordered a minute of silence in schools. And, on another note, Schleifer intimated earlier this month that the Gaza conflict should lead Turkey to re-think its own policies toward its Kurdish minority. A recent decision by Israel to ban two Arab political parties -- both of which claim to represent a significant sector of Israel's Arab minority population of approximately 1.2 million people -- should make Turkish policy makers think twice about banning DTP. Also, for Turkey to consider is its opposition to an international treaty banning the use of cluster bombs. The bombs -- which, left unexploded, detonate like land mines long after conflict has concluded -- have been used in the Israeli operations, alongside white phosphorus gas. On Saturday, I closed my post on Gaza with a note about anti-Semitism. Below is a video documenting protests in Tel Aviv by PeaceNow, an Israeli peace group. PeaceNow advocates Israel's withdrawal from the occupied territories, and has called repeatedly for a ceasefire and an end to the Israeli operations in Gaza. UPDATE 1/14 -- The Spanish newspaper El Mundo is reporting that Hamas is prepared to conclude a short-term ceasefire on the condition -- among others -- that Turkey be the guarantor of any peacekeeping force. Hamas also indicated it is ready to consent to international monitors, and listed their deployment among conditions for the ceasefire. The Syrian faction of Hamas has been the most recalcitrant in negotiations, arguing that any short-term ceasefire should be conditional on Israel giving up something in return. Heh, the MEQ's new issue comes out with pretty much all barrels firing. 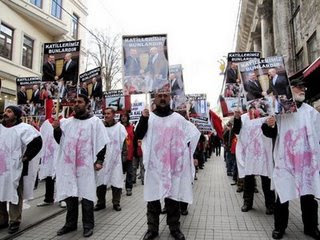 Islam in Europe and Gulen's movement are featured in a manner you'd now expect. They used to be more reserved about Gulen (I re-checked the archives) but this latest article could have been from Cumhuriyet. In fact it is excerpted in Cumhuriyet, and that it is excerpted there is news on Turkish Zaman's (web) front page. The fun stops there though, I haven't found anything in Cumhuriyet talking about Zaman talking about Cumhuriyet excerpting from the MEQ article on Gulen and the AKP. Not yet, anyway. Let me know when/if you do. The Cumhuriyet/neocon alliance is still darkly amusing to me. I really do think the Zaman Group would do better not to think too much about some of these neocons . . . it is good to keep an eye on them, but, of course, a good bit of the indignation is a bit propagandistic, giving too much credit to the sway people like Rubin have nowadays. For an example, see TDZ in June. One look at MEQ's editorial staff tells you just how laden with ideology its product is. It is worth noting that some of Rubin's sloppy accusations this last year were borrowed from Cumhuriyet's pages, harkening back to Judy Miller quoting high level administration officials who were in turn quoting Miller -- though, Cumhuriyet is no NYT. Maybe Miller can learn Turkish?